Sensitive combination skin gets balanced day or night with our light fragrance-free and hypoallergenic Almond Soothing Facial Lotion. This moisturizer with organic sweet almond oil gently restores your skin’s natural balance and strengthens its protective barrier without irritating your skin. Organic sweet almond oil in Weleda Almond Soothing Facial Lotion gently nourishes your sensitive skin and protects against moisture loss with rich, essential fatty acids. Plum kernel oil in our Almond Soothing Facial Lotion contains high quantities of antioxidants and vitamins A and E, which easily absorb to soothe and calm sensitive or reactive skin. Your skin is protected and left feeling supple and smooth when you use Weleda Almond Soothing Facial Lotion. When balanced moisture is restored with organic sweet almond oil, there’s nothing left to be sensitive about. cette crème est très bien pour ma peau sèche, mais elle ne marche pas comme base de maquillage.. Le fond de teint ne s'étale pas bien ça fait des patés.. 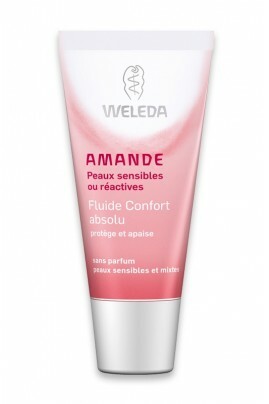 Apply a small amount of Weleda Almond Soothing Facial Lotion on the face, neck and décolleté. Massage in gently. Use only as much as the skin can fully absorb. For dry skin Almond Soothing Facial Lotion can be used in combination with the more deeply protective Almond Soothing Facial Cream, or it can be mixed with a little Almond Soothing Facial Oil to produce a richer cream. Water (Aqua), Prunus Amygdalus Dulcis (Sweet Almond) Oil, Alcohol, Glyceryl Stearate SE, Glycerin, Hydrolyzed Beeswax, Prunus Domestica (Plum) Seed Oil, Xanthan Gum, Lactic Acid.